With clown-painted faces, Juggalos are easy to write off. But maybe we should be paying a little closer attention to them. He goes by Zilla here, but his name is really Gary. Before posing with a wrestling belt and hardening his clown-painted face for the camera, he hands off a half-eaten Popsicle to a woman standing nearby. She might be his mom, and as she struggles to balance an armful — a jacket, a bottle of soda, Gary’s Popsicle — she smiles at him and his friends as they pose. He tries to add his wrestling belt to her load, but she yells at him, “No! Finish it! Finish it!” — thrusting the dripping Popsicle back at him. He wraps the fat belt over his shoulders and eats the last of his frozen treat. The line outside the Knitting Factory last Thursday — the one to get into the Insane Clown Posse show — wraps around the northwest corner of the building and heads down Monroe Street an hour and a half before the doors opened. It is an explosive scene: young clowns breaking into demanding chants of “Family! Family! Family!” One of the older clowns, the main rabble-rouser toward the front of the line, starts a call-and-response. “Who’s goin’ chicken huntin’?” he yells into the air. “We’s goin’ chicken huntin!’” the masses yell back. Streams of shaken-up soda — Dr. Pepper, Mountain Dew, Faygo — rocket through the air above them, drenching everyone nearby. But no one balks or wipes it off. The soda dries in red and green splotches over their dutifully applied face paint. 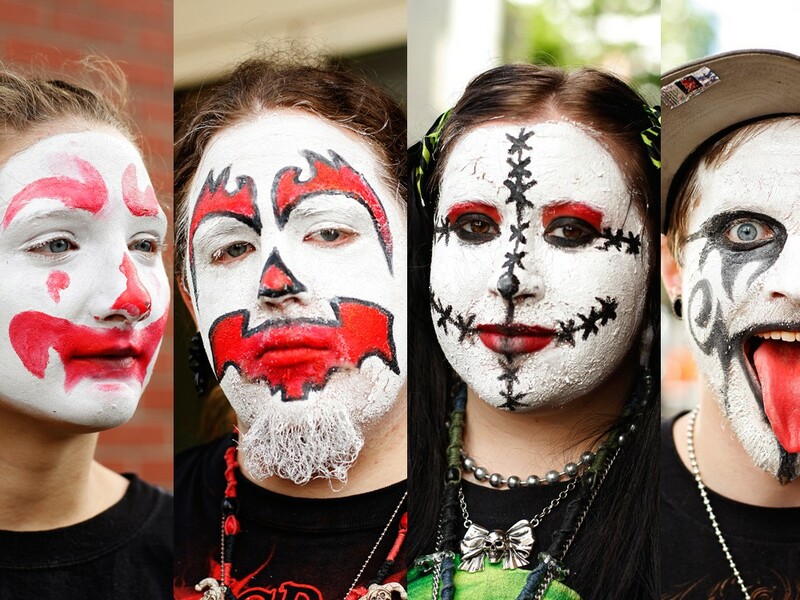 They’re Juggalos: diehard fans of Detroit-based horror hip-hop group, Insane Clown Posse. They’re not new — the band or the fan base — but they’re certainly a noticeable group in Spokane: turning out en masse for any Psychopathic Records act (ICP’s label) and driving the local “horrorcore” record label, Chop Meat Records. Where KISS inspired fans to wear face paint back in the 1970s, Insane Clown Posse — a duo known for rapping about eating dead bodies, hunting hillbillies and committing mass murder — has inspired their fans to take it to another level. Juggalos — sometimes more than 20,000 of them — from across the country descend on Cave-in-Rock, Illinois, each summer for the annual Gathering of Juggalos. It’s a concert, but it’s an event fans call a “family reunion.” And that’s how Spokane Juggalos described themselves last Thursday afternoon: a family. A family who backs up each and every one of its members. They speak of a constant need to defend each other, to have each other’s back — for what and against whom, they don’t say. It’s blind love — a lifestyle not to promote violence, they say, but to find friendship. But being a Juggalo isn’t casual either — this is a mark that’s branded on their hearts. And that’s endearing, pitiful and, yet, incredibly terrifying.